The proliferation of tech-driven investment opportunities, the general distrust of the traditional financial market in the wake of the last financial crisis and a global drive to find different ways of driving profits while democratizing finance and investment all mean that 2019 is a great time for anyone looking into making profitable investments to seriously consider the alternative market. Before we get into the details on the benefits of these non-traditional investments, it is important to understand how investments are classified. Traditionally, investments have been grouped into asset classes, which are groups of assets that share similar risk and return characteristics. They also tend to react in a near uniform way to market events and pressures. 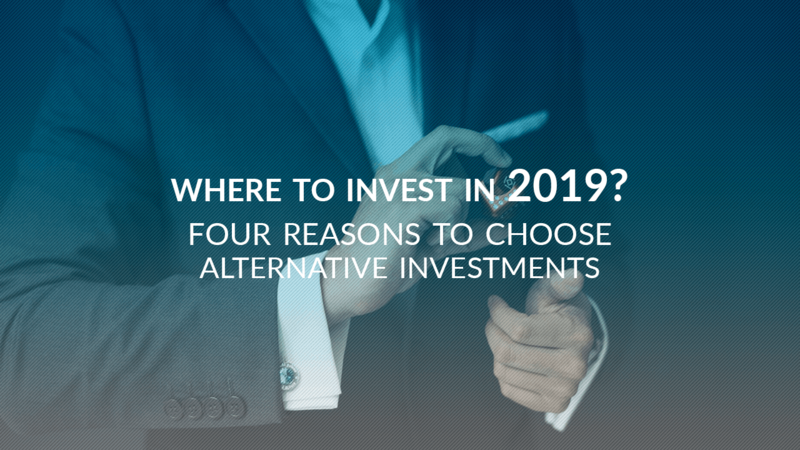 At its heart, an alternative investment is something that behaves entirely differently from the traditional classes of bonds, stocks or currency. While there are myriad smaller options and niche opportunities, for the purpose of this article we will look at the main ones which tend to be hedge funds, private equity, venture capital, REITs, trusts deeds, objects (coins, wine, stamps) and P2P lending investment. Until quite recently, alternative investments were almost solely reserved for high net-worth individuals. This was due to the fact that many of these opportunities have high minimum investments and fee structures compared to mutual funds and exchange-traded funds (ETFs), which are generally accessible through traditional financial institutions. As an example, the trade in rare coins is seen as an alternative investment but has a high barrier to entry. One requires specialist knowledge as well as fairly deep pockets to enter this asset class. In addition, it offers relatively low liquidity, as selling a collection of rare coins is much more specialized and market dependent than selling a chunk of stock in Google or Apple. The good news for keen investors is that the democratization of investment brought on by technology has reached the alternative arena as well, meaning you no longer need to be a millionaire to make non-traditional investments although, if you play your cards right, you may become one sooner than you thought was possible. Here are four reasons you should be looking beyond the traditional asset classes to make your money grow. It is almost impossible to overstate the importance of diversification when it comes to investment. During the financial crisis at the end of the ’00s, the media was rife with tales of people who saw their entire life savings, retirement funds, and investment portfolios wiped out in one fell swoop. Almost invariably they had entrusted their financial life to just one institution and paid a very high price. What this taught us is that conventional investments do not offer enough diversity. Going alternative and investing in several different sectors that would react differently to major financial events is of vital importance. A stock market crash may wipe out stocks and bonds, but it tends to have little long-term effect on property values, especially in established areas. This is of course provided you are not going into debt to invest in said property. By ensuring that your portfolio contains a variety of asset classes with little correlation to each other you will massively improve your chances of remaining profitable when investment markets start to decline. Contrary to what banks and mainstream investment firms would have you believe, traditional assets are the most volatile during a large-scale financial crisis. Alternative investments give you access to the best and most attractive investment opportunities anywhere in the world, regardless of your own location. By going alternative you can explore high-growth markets wherever they are, whether in a neighboring country or halfway across the globe. This ability to take advantage of opportunities wherever they arise is now open to even the armchair investor, all from the comfort of their own home. Through P2P networks and crowdsourced funding drives you can invest in an Estonian tech start-up, a Lithuanian property development, a Kenyan farmers’ collective and a South African security business all in one day and without leaving your living room. This sort of diversity ties in to point one above, in that it helps increase the security of your portfolio and safeguards against regional financial crises like the one recently witnessed in Greece. When you decide to invest a monthly sum of money into a mutual fund you are trusting the fund managers and financial institution to control your financial destiny. Your money forms a small part of a large pool and you are consequently a small fish in a very large pond. Not only will you be just a number, but you’ll also be charged fees, early exit penalties and may even face long waiting periods to access your own money. Then, of course, there is the danger of the entire fund failing, something that has happened frequently in the past for reasons ranging from managerial incompetence to poor decision-making. If we look at the P2P investment market, there is a general trend to waive all fees for investors, at least from reputable organizations. The fact that these markets are heavily tech-driven also mean that you can be as involved in the granular decisions as you want to be, and no longer need a degree in finance to become a successful investor. A new ear of user-friendly investment opportunities with low barriers to entry means you can easily take control of your own financial destiny. We’ve left the best for last. Alternative investments are generally more profitable than their traditional counterparts and can also generate better returns over a shorter period. Due to a general willingness to accept more risks than banks, lower operational costs and smarter ways of using tech, many of these newer opportunities manage to outperform their traditional counterparts quite significantly. Choosing smartly and making sure you invest your money in a trusted platform with good security should see you reap great rewards for being adventurous and going alternative. If you would like to learn more about the world of alternative investments, feel free to visit https://estateguru.co and start investing from as little as €50.